For the work in arboriculture we propose several possibilities of tool assemblies which will adapt to your agricultural equipment. 1 tool positioned on the right or on the left, assembled in front, between the wheels or behind the tractor. A lifting or a tilting device is necessary for this configuration. 2 tools fixed on a pendulum chassis absorbing the asperities of the soil which are positioned in front or behind the tractor on the lifting device. It is possible to add tilting and/or lifting devices for an edger (back or front). The brush NaturaGriff proposes you a solution of mechanical weeding in your orchards by taking into account the problem of the roots of your trees. 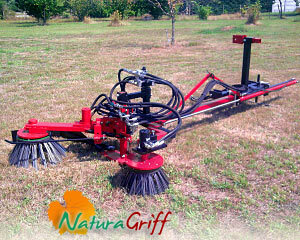 The brush allows you an on-surface work to eliminate the grass and the superficial roots. We can work with the brush of mechanical weeding by respecting your systems of irrigations (pipes, drip,..), on a working band of going 1m20 on both sides trunks, with a rectilinear work favoring the passage of a crusher. A maximal speed of progress of 5km/hour, a levelling and a chassis which can deport the tool in 3 meters of the axis of the tractor shall allow you to maintain your orchard in complete safety. do not hesitate to contact NaturaGriff for a personalized study. Our material in guaranteed 2 years parts and hands of work. This guarantee extends until 5 years for the hydraulics parts under conditions of maintenance*. All our machines are manufactured with standard parts eassily available in trade. *Except seals - check suppliers.